I’m an anarchist and I vote — within collective projects, occupations (the good kind), neighborhood assemblies, and other directly democratic face-to-face structures, wherever and whenever I find them. Such voting is miles apart, conceptually and systemically, from electoralism and how much it distracts from the real work of us remaking society. 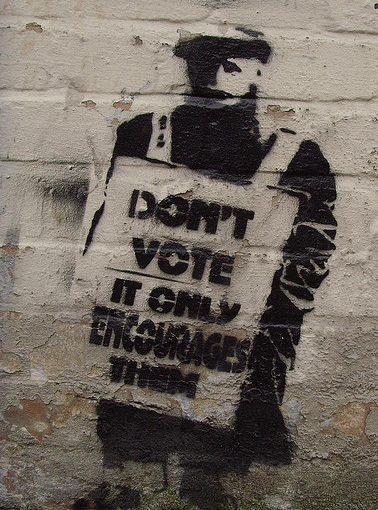 So as some of us anarchists tried to encourage a few presidential election cycles ago, “Don’t Just (Not) Vote.” It’s what we do 24/7, 365 days of the year (minus a few minutes in a voting booth, for those so inclined) via our own self-organization that matters, that might, with collective strength and decision making, actually get at the root causes of all that ails our world and, simultaneously prefigure better versions of social and ecological relations. This entry was posted on November 4, 2014 by Cindy Milstein in Dispatches from Rebellious Spaces.